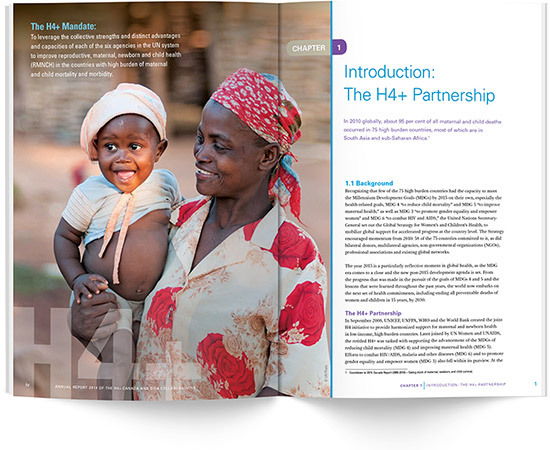 The mission of the H4+ Partnership is to have organizations work together to improve women’s and children’s health. This 58 page annual report is designed to A4 dimensions and uses icons in the design hierarchy as a tool for visually identifying areas of progress within policy and programme levels of collaboration. These icons are also used to organize text in a series of Specific H4+ achievements at-a-glance panels at the end of the book. Prographics also includes a series of graphically supported trending factoids as country highlights to reinforce editorial content. This publication is an example of how we can coordinate practical design, print and delivery services working with multiple clients.